How understated and elegant is this jewelry from Upper Metal Class? 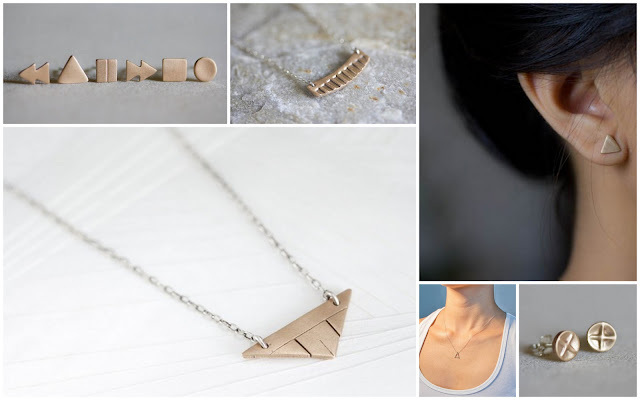 I just adore the delicate triangle necklace and the triangle stud earrings....and you just can't beat those prices! Everything is for the most part under $40...making them the perfect gift to give to your best girlfriends or sister. I surely wouldn't mind picking up some of these pieces - I just love the look of handmade jewelry, and the patina on these are gorgeous. Wondering where "T", the artist behind these little lovelies, gets her inspiration? She writes, "I really enjoy creating things that I like to wear and being able to share it with others who can appreciate my designs. My jewelry is simple, clean, and classic with a sweet subtle hint of drama. My inspiration comes from anything and everything. I love architecture and there are some influences of it in my designs. All in all I just make things that feel comfortable, sleek and easy to wear while striving towards a way to enhance a persons look." Now go check it out Upper Metal Class on Etsy for yourself...I think this designer is one to watch!